FINLAND – Due to confined spaces, hot environments and arduous tasks, grinding mill relining can be a challenging job for even the most experienced crew. The most critical and potentially dangerous part of this process is the operation of the mill reline machine. Outotec‘s new 7-axis beam mill reline machines (MRMs) set a new benchmark for safety and are the only MRMs that fully comply with the European Machinery Directive. Safety drove every aspect of design in Outotec’s 7-axis beam MRMs. The beam MRMs can be maneuvered using a conventional rail arrangement or optionally a tire drive system, which provides increased flexibility for transport around the mill deck. 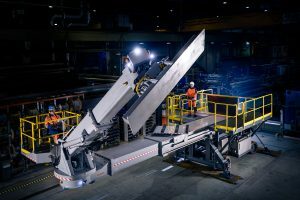 A travelling liner cart with powered slew for rotating liners and a crane with 7° of freedom for manipulation of the liners inside the mill ensures safe, efficient, and reliable operation. Simply put, Outotec’s mill reline machines are the safest on the market. Featuring remote control operation, state-of-the-art electro-hydraulic proportional control blocks with advanced fault detection, and safety rated components and systems. Safe machine design is a primary focus. Alignment camera system for grapple (optional). In addition to 7-axis beam mill reline machines, Outotec (www.Outotec.com) offers other types of MRMs designed to specifically for the smaller SAG mill and ball mill market, as well as full life cycle services for maintaining and optimizing mills.